Selling Price: Typically, FSBO’s sell at a lower price then properties represented by a Realtor. In 2015, the average Realtor listed home sold for 23% more than a home listed for sale by owner. A Realtor understands the market and knows what homes are selling for. They are also there to negotiate the best offer, with the right terms for you. Time on Market: According to the National Association of Realtors (NAR) time on the market is decreased when using a Realtor. NAR’s research shows that a home sold through a Realtor sells 22% faster than a For Sale By Owner property! If you need to sell quickly, a Realtor can get it done. Realtors have access to not only the MLS but also to clients that are looking for a home like yours. 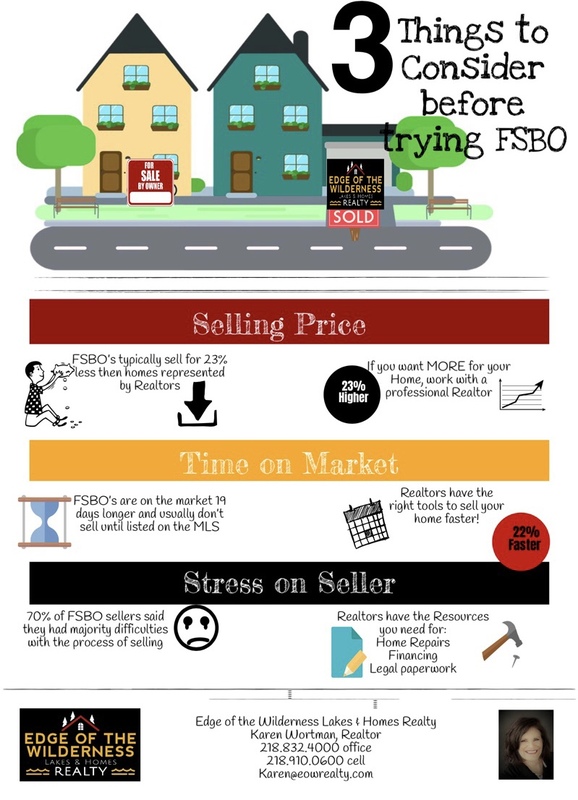 Stress on the Seller: 70% of FSBO’ers say they’ve had major difficulties when trying to sell their property. Whether it is getting the listing price right, navigating the legal paperwork involved, or simply negotiating with potential buyers, selling on your own can be very stressful. A Realtor has the knowledge and resources to overcome these obstacles and their job is to get you the most for your property in the least amount of time. A Realtor represents your interest. Before putting up your For Sale By Owner sign, talk to a Realtor like Karen Wortman and find out what she can do for you.